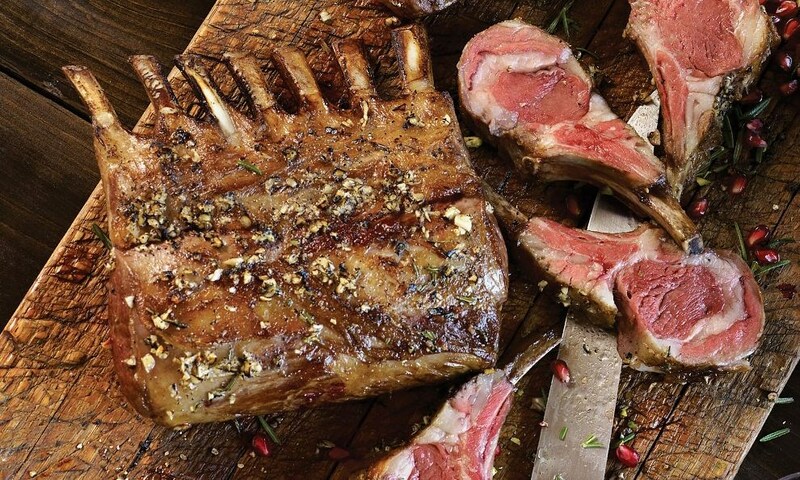 New Zealand racks of lamb - each serving 2-3 people. A more subtle flavor than the loin chops paired best with your favorite marinate. Oven-bake at 350° for 20 minutes or slow-cook on the grill. In a small skillet heat the oil over moderate heat until it is hot but not smoking, add the red pepper flakes, and cook them, stirring, for 10 seconds. Add the garlic and cook it, stirring, for 30 seconds. Add the scallion and the rosemary and cook the mixture, stirring, for 10 seconds. Stir in the bread crumbs and salt and pepper to taste and remove skillet from the heat. Heat an ovenproof skillet over moderately high heat until it is hot. Season the rack of lamb. Brown the lamb turning it, for 5 minutes, or until the sides and the ends are browned evenly. Pour off any fat from the skillet, arrange the lamb, fat and meat side up. In a small bowl stir together the mayonnaise and mustard until thoroughly combined. Brush or spread the mayonnaise and mustard mixture over the fat and meat side of the lamb. Pat the crumb mixture evenly over the mustard. Roast the lamb in the middle of the preheated oven for 15 minutes, or until a meat or an instant read thermometer registers 130 degrees F for medium-rare meat. Transfer the lamb to a carving board, let it stand, uncovered, for 10 minutes. Carefully cut the rack, between the rib bones, into individual or double chops taking care not to loosen the bread crumb mixture from the meat. Beat eggs, sugar and margarine. Add milk and vanilla. Add mixture to mashed sweet potatoes and place in a greased 2 quart baking dish. Mix brown sugar, flour and margarine together making fine crumbs. Place on top of sweet potatoes, then cover with chopped nuts. Bake for 45 minutes ar 350 degrees. I usually use more sweet potatoes than called for so that I have more and it’s not quite so sweet. I don’t measure, but I’d imagine it works out to 4 or 5 cups instead of the 3.